30 Second Wine Advisor: Bourbon or Scotch whisk(e)y? With just over three weeks left before our Burgundy tour, we're still looking for a few wine-loving procrastinators to fill the last few seats.  Bourbon or Scotch whisk(e)y? We take an occasional break from wine to report on an unusual, mouth-watering "debate" between spirits experts. Just three weeks left before we take off on this memorable tour of Burgundy! 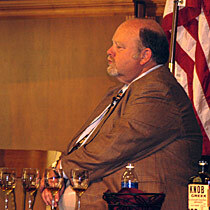 Fred Booker Noe, Jim Beam's great-grandson, ponders four glasses of whisk(e)y. When it comes to liquor, what's your pleasure? Scotland's "water of life" or Kentucky's corn-based nectar? In one of our rare, occasional breaks from wine for a visit to other adult beverages, let's peek in on an unusual, mouth-watering "debate" on the relative merits of these two historic whisk(e)ys. That parenthesized 'e' is intentional, by the way: The corporate organizers of the Great Whisk(e)y Debate held this week at Louisville's Churchill Downs racetrack styled it that way to reflect trans-Atlantic customs: In Scotland, the wee dram is spelled "whisky," while Kentuckians usually add the (e) in Bourbon "whiskey." This was just one of dozens of whiskey-related factoids that flew fast and furious in Wednesday's "debate" between Scotch and Bourbon experts. The debate showcased four products of Future Brands LLC, a Chicago-based drinks conglomerate that distributes Jim Beam Bourbons and their upscale "Small Batch Bourbon Collection," Absolut vodka, various Scotch whisky brands and many other potables. It pitted the company's "Scotch Master Ambassador" Simon Brooking, resplendent in tartan kilt and sporran, against Fred Booker Noe, a Kentuckian who almost literally has Bourbon running in his veins as seventh-generation Beam family heir and great-grandson of namesake Jim Beam. It was moderated by Bernie Lubbers, a local comedian and singer who, in his day job, sports the title "whiskey professor" as Future Brands' "Goodwill Ambassador of Brands." Brookings' soft burr played counterpoint to Noe's twangy rural Kentucky drawl as Lubbers tossed them softball questions in turn. The debate proved more of a love-fest (with jokes) than a fight, and the final result was declared a tie. But plenty of interesting information came to light, with small tastes of two excellent Bourbons and two fine Scotches at the end. Let's sum up a few highlights, then finish up with brief tasting notes.  What is whisk(e)y? Under U.S. law, whiskey is an alcoholic beverage distilled from a fermented "mash" of grain - typically corn, rye, wheat or barley - and aged in oak barrels. Types include Scotch, Bourbon and other American whiskeys, Irish whiskey and Canadian whiskey.  What is Bourbon? Under the law, Noe said, Bourbon must be made in the United States (virtually all of it is made in Central Kentucky), and must be made from at least 51 percent corn. It must be aged for at least two years in new, charred oak barrels.  What is Scotch? Made in Scotland, of course, this whiskey is made from malted barley smoked over peat, distilled in copper pot stills and aged for at least three years in oak barrels that usually have been previously used for other beverages such as Sherry or even Kentucky Bourbon. Thrifty Scots re-use everything, joked Brooking, adding, "we have short arms and deep pockets."  How long have they been at it? Bourbon arrived in Kentucky shortly after the first settlers arrived in the 1770s, Noe said, adding that canny Kentucky farmers, fleeing whiskey taxation in the original 13 states, planted corn and turned a good bit of it into whiskey. Scotch whisky, originally "uisqebaugh" ("water of life") has been made since the 13th century, Brooking said. "We regard Bourbon as a bit of a fad ... it's only been around a couple of hundred years."  Does climate matter? Scotland is chilly and damp, creating a gentle environment for aging whisky in its barrels over a long, slow spell. Kentucky's distinct four-season climate, with short but freezing winters and searing summers, moves things along more briskly, so fine Bourbon matures as much in seven or eight years as a Scotch in 15 or 20. Moreover, Noe said, Kentucky's climate is perfect for growing the corn that gives Bourbon its signature flavor.  How do you taste this stuff? Pretty much the same way you taste wine, with some modifications based on its high alcoholic strength. It's essentially the same process, though, breaking down the pleasant analysis into four sensory steps: Look, smell, taste and think about it all. Darker color (more wood extract) tends to predict body and robust flavor. Put your nose in the glass and sniff, just as you do with wine; both experts recommend, however, opening your mouth wide as you smell - a procedure not usually needed with wine - to allow the strong alcoholic aromas to dissipate and better display the more subtle aroma elements. An old distiller's trick: Put your hand over the glass and shake it just enough to lightly dampen your palm. Rub your hands together, then open your palms and smell. The effect, Brooking said, is like opening a door and walking into the distillery barrel room. When you taste, Noe said, swish the fluid all around the inside of your mouth, just as with wine. And unless you're a professional sampling dozens of samples, don't spit. "When I see a Bourbon maker spit it out, I know he's got a bad batch," Noe laughed. Even if you normally prefer your liquor "straight," consider putting in a splash of water for analytical tasting; diluting the spirit to reduce its alcoholic strength may help show off its more subtle flavors. The whiskeys, all from Future Brands' portfolio, were clearly chosen to represent Bourbon and Scotch at their stylistic extremes. Each pair featured one spirit in a light, approachable style and one in a bold, pedal-to-the-floor rendition. The dignitaries walked the group through the tasting with detailed analysis and descriptions, but I sneaked in most of these notes before their presentation, preferring to draw my conclusions without guidance. Pale gold color suggests a Bourbon in the lighter style. Spice and grain scents suggest rye grain in the "mash bill" (recipe), an assumption that Noe later confirmed. On the light side for a Bourbon, almost delicate, an approach that's almost too effete for this Kentuckian, and perhaps for Noe, too, as he pointed out that it's a good choice for mint juleps because the light whiskey flavor doesn't overpower the mint. Relatively dark in color, a rich copper-gold, it offers characteristic Bourbon aromas of sweet caramel, leading into a smooth, sweet flavor that invites quiet, contemplative sipping, perhaps best taken neat from a heavy glass with a single ice cube. Clear, transparent bronze, with a sweet, light aroma that carries a hint of iodine and a touch of sea breeze on the nose, distant honey on the palate. As a Scotch, this Highland malt is comparable to the Basil Hayden's: It's on the light, inoffensive side, easy to sip. Dark gold, this peaty, smoky potation pushes the wild aromas and robust flavors of the Scottish island malts to the extreme, and I like that. As a Kentuckian, I have an instinctive attraction to quality Bourbon, and it's been a pleasure to watch the development in recent decades of top-tier "small-batch" and "single barrel" bottlings that seek to capture some of the high-end market that single-malt Scotch had dominated for years. But I'll confess to a certain fondness for fine Scotch, too, particularly those hearty, peaty Islay malts. Isn't it good that we've got both to choose from? Monday, we'll be back to wine, with reviews of a couple of good new wine books including a preview of an outstanding item on Beaujolais that's coming out this autumn. 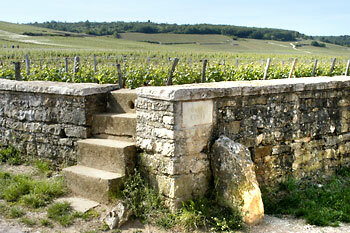 Three weeks left until our Burgundy tour! With just over three weeks left before our Burgundy tour, we're still looking for a few wine-loving procrastinators to fill the last few seats. This July 2-7 tour will feature VIP-style tours, excellent meals and comfy accommodations.